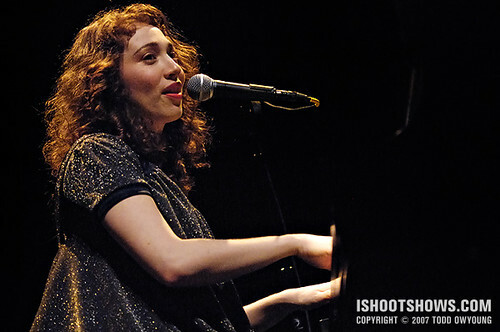 Wearing a shimmering dark gray dress, Regina Spektor flew through a quick set that clocked in just over an hour, including the encore. Having played the small, 300-capacity Creepy Crawl almost exactly a year ago, it was rewarding to see Spektor playing the Pageant to 2,000 smiling fans in a sold-out show. After opening with an a cappella vocal solo, Spektor quickly set into her comfortable place at the piano. 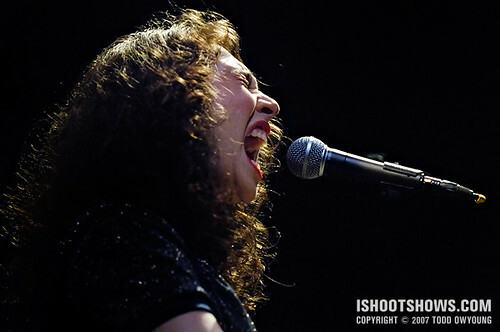 Running a tight setlist that pulled primarily from her 2006 release Begin to Hope, Spektor wove her anti-folk charm for the rapt audience, slyly looking to the crowd during her vocal aerobatics. Touching on all three albums, the greatest crowd pleasers arguably came with the encore performances of “Fidelity,” “Us,” and “Summer in the City,” the latter of which brought an understated climax to the set with a simple but elegantly powerful use of lighting. When I arrived at the venue, I noticed that the barricade for the photo pit was unusually close to the stage. Instead of the usual two to three feet of clearance, the barricade was only pushed out from the stage less than a foot. 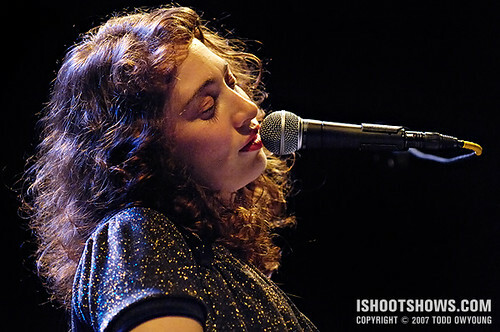 Checking with security, I was informed that the barricade setup was at the preference of Regina Spektor's people. Still, despite the very narrow margin, shooting from the pit was still allowed. Instead of the first three, the songs approved for photography were second through fourth songs, excluding the a cappella first song of Spektor's set. 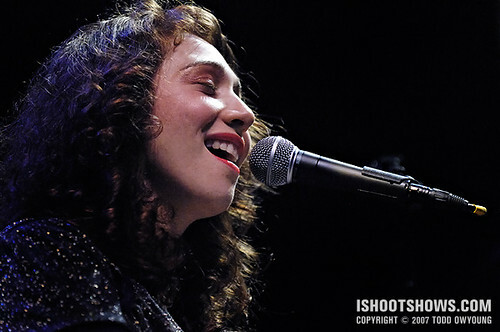 Lighting for Regina Spektor's set was relatively simple with very little variation between songs, and consisted primarily of backlighting with relatively weaker front lighting. The basic difference in the lighting came in the temperature of the front lighting, which shifted between between warm and cool in relation to the predominately warm backlighting. The climax of the lighting came during Spektor's encore performance of “Summer in the City,” which made use a small multitude of hanging lights against the back curtain, as well as three larger hanging bulbs at the front of the stage. While these lights had remained just barely above a faint glow throughout the hour-long set, they came do life during the finale, blazing to recall the constellations of city lights at night. With relatively constant lighting, I shot around f/2.8, 1/125 second and ISO 1600 for the majority of the set, dipping to ISO 1250 on occasion. For this show, I used the Nikon 85mm f/1.4 and Nikon 70-200mm f/2.8 for the majority of the three alloted songs, while the Sigma 30mm f/1.4 came into play for the single wide shot of the singer at the piano. 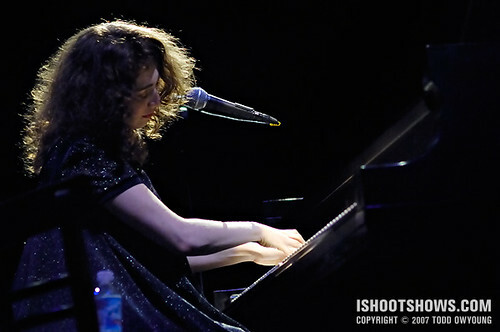 With her piano situated in the middle of the stage, the two telephoto lenses were essential for picking up the tighter shots of the singer-songwriter. Fantastic photos. f/2.8 at 1/250, great choice. Sarah: Thanks, Sarah! Glad you enjoyed the photos. Todd: Thanks for the comment! 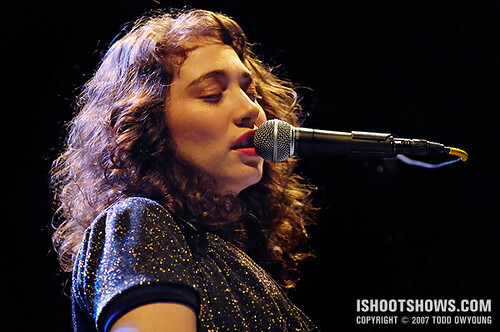 It was a very short concert, but Regina Spektor put on a great show nonetheless. I’d recommend seeing her in concert if you have the chance.